Dubai, UAE, 13 November 2017- Emirates Flight Training Academy, the state of the art facility for training ab initio pilots was officially inaugurated today by His Highness Sheikh Mohammed bin Rashid Al Maktoum, Vice President and Prime Minister of the UAE and Ruler of Dubai during the Dubai Airshow. Dignitaries present at the opening included His Highness Sheikh Mohammed bin Rashid Al Maktoum, Vice President and Prime Minister of the UAE and Ruler of Dubai; His Highness Sheikh Hamdan bin Mohammed bin Rashid Al Maktoum, Crown Prince of Dubai and Chairman of Dubai Executive Council; His Highness Sheikh Maktoum bin Mohammed Al Maktoum, Deputy Ruler of Dubai, and the Chairman of Dubai Media Incorporated; His Highness Sheikh Ahmed bin Saeed Al Maktoum, Chairman and Chief Executive of Emirates Airline and Group, and Sir Tim Clark, President Emirates Airline. 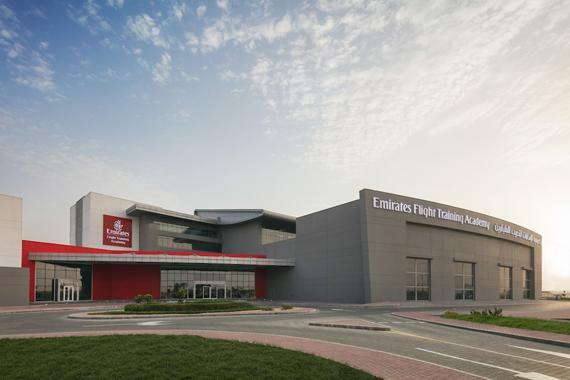 Located in Dubai South, the Emirates Flight Training Academy has been established by Emirates to qualify UAE nationals and international students. It will instill cadets with an airline culture and train pilots for the airline industry’s future requirements and in particular, Emirates. The Academy will combine cutting-edge learning technologies and a modern fleet of training aircraft to train cadets with no previous knowledge of flying. Cadets will be trained using simulators, single and multi-engine aircraft; and provided with theoretical knowledge of the aviation industry to facilitate their transition into the airline business. The investment in the facility underscores Emirates’ commitment, as a global leader in aviation, to put in place modern infrastructure to help develop career-ready pilots for Emirates and the broader aviation industry. The Emirates Flight Training Academy was first announced at the 2011 Dubai Airshow. Construction for the facility started in 2015, and early this year, landside facilities as well as the first phase of accommodation were completed. The Emirates Flight Training Academy is a full-residential facility spread over an area of 164,000 square metres. It includes 36 ground school classrooms, ground based simulators, a fleet of 27 training aircraft, a 1,800 metre dedicated runway with modern navigation aids and lighting, an independent air traffic control tower, rescue and firefighting service, and a maintenance centre. Cadets, both male and female, admitted into the programme will have access to modern and individual studio accommodation in addition to a range of comprehensive sports and leisure facilities. The Academy will be able to accommodate up to 600 cadets at one time. Cadets progress through a training curriculum that starts with classroom based ATPL (Airline Transport Pilots License) training in addition to any foundation courses that may be required including English language training. The Academy has an innovative approach to training with cadets first learning to fly the single-engine piston Cirrus SR22 G6 aircraft and then directly progressing to the Phenom 100EV very light jet (VLJ) aircraft. This is in variance to the regular training convention where cadets progress from single-engine piston aircraft to twin-engine piston aircraft before transitioning to jet aircraft. The Academy’s approach eliminates an additional step in cadet training and provides cadets with more experience on jet aircraft. Cadets will graduate with a Commercial Pilot License (CPL) on a multi-engine aircraft with Instrument Rating, and frozen ATPL. The total course duration will vary between 21 months and 3.5 years depending on whether cadets require foundation courses in addition to the regular curriculum. The Academy will use a four-pronged approach for pilot training: interactive learning for theoretical subjects in classrooms, practical learning in the most capable training aircraft, practical learning in advanced flight simulators, and airline-focused line-oriented flight training. Classrooms at the Emirates Flight Training Academy will be equipped with the latest technology to engage cadets in the learning process. The curriculum at the Academy will be completely paperless and cadets will learn with highly interactive digital content delivered in purpose-designed classrooms and on personal tablets. Emirates Flight Training Academy has also partnered with Boeing for an integrated software system to manage cadet learning and training flight operations. In addition, learning in the classrooms will also be delivered using fully immersive Virtual Reality (VR) technology to help cadets gain a deeper understanding of the principles of flight and aircraft operation. Cadets will also gain familiarity with flight operations and will be trained to handle various scenarios with advanced simulators and various ground-based training devices. The Emirates Flight Training Academy has invested over US$ 39 million in a modern fleet of 27 training aircraft- 22 Cirrus SR22 G6 single-engine piston aircraft and five Embraer Phenom 100EV very light jet aircraft. The Cirrus SR22 G6 aircraft will form the backbone of the Academy’s fleet. It incorporates a modern composite airframe, two large 12” flight displays, a flight management system keypad controller and an integrated engine indication and crew alerting system, making it an ideal choice for ab initio pilot training. The Academy has currently taken delivery of six of the 22 aircraft. In July 2016, the Emirates Flight Training Academy became one of the launch customers for the Embraer Phenom 100EV aircraft when it upgraded its previous order for five Phenom 100 E aircraft. The Phenom 100EV is an evolution of the Phenom 100 business jet which is considered an obvious choice by airlines for preparing cadets for multi-engine jet operations. The aircraft incorporates three interchangeable glass displays, state-of-the-art avionics, smart automation systems and graphical flight planning capabilities. The first of the Academy’s Embraer Phenom 100EV aircraft arrived in Dubai earlier this month. At the Emirates Flight Training Academy, cadets will complete at least 1,100 hours of ground-based training and 315 hours of flight training (including simulator flying) using a competency based approach. This will ensure that the training exceeds guidelines prescribed by authorities for ab initio pilot training.